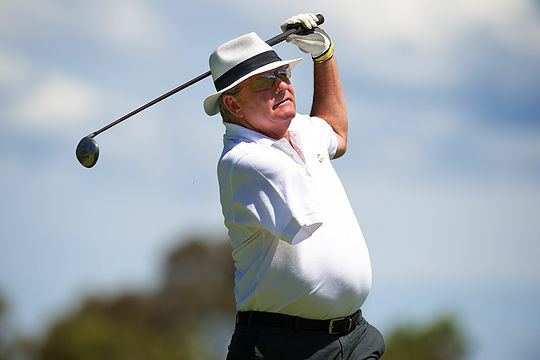 One of Australia’s best players and a man who has dedicated a life’s work to the betterment of others in the game of golf is to be formally acknowledged for his contribution to the sport. A great competitor in his playing days, Jack Newton became a force in the development of junior golfers, for which he will be recognised on October 13 when inducted as a general member of the Sport Australia Hall of Fame. Newton turned professional in 1971, winning his first title at the Dutch Open in his second year out, then backing it up with victory at the Benson & Hedges event in England the following week. Newton notched victories around the world including wins on the PGA Tour, the British Match Play and Australian Open crowns, with runner-up finishes at the 1975 British Open (in an 18 hole playoff to Tom Watson at Carnoustie) and at The Masters Tournament behind Severiano Ballesteros in 1980. With his father Jack on the bag, Newton enjoyed one of his proudest moments in winning his Australian Open title at the Metropolitan Golf Club in 1979 against a field that included the reigning Open champion Ballesteros, reigning Masters champion Fuzzy Zoeller, reigning US PGA champion David Graham, Gary Player and Greg Norman. Following a near fatal accident that brought an early end to his playing career just four years later, Newton focused much of his attention on his passion for developing junior talent through the Jack Newton Junior Golf Foundation. Established in 1986, the aim was to introduce young boys and girls to golf and many of today’s modern day champions, including Jason Day and Adam Scott, have benefitted from the pathways established by Newton. Newton’s contribution to the game also extended to golf course design and as an always insightful and entertaining commentator on golf telecasts in this country and overseas. Mostly though, Newton is regarded as quintessentially a good bloke with a great sense of humour – he told me last year the younger generation might not know him but “I’m pretty hard to miss with only one duke (arm)” – is always generous with his time and for honest opinion on all things golf and his beloved Newcastle Knights. Congratulations on the recognition, Jack.